Stainless steel is a generic name for several different types of steel alloys, all of which are a minimum of 10.5% chromium by mass. And even though steel has been used to store and transport water for over 150 years, it’s being embraced as a reliable and durable way to store chemicals as well. With that in mind, here are just a few of the top benefits of dimpled stainless steel chemical storage tanks. First and foremost, stainless steel tanks are incredibly durable. They’re virtually indestructible, even when used to store corrosive chemicals. Stainless steel tanks also show resistance to becoming misshapen and can resist cavitation. In general, they’re much better at preventing or reducing wear and tear than other materials. This also makes for increased safety, since any corrosive materials stored improperly could have dangerous results. As mentioned, stainless steel chemical storage tanks are superior when it comes to corrosion resistance and protection. While concrete and plastic storage tanks often fall apart or allow for chemicals to corrode and cause damage, stainless steel metals resist oxidation and corrosion through durable and insulated layering. That’s right — in most cases, you don’t need additional industrial coatings to ensure corrosion resistance — stainless steel is inherently resistant to corrosion, and thus chemical leaks. Finally, stainless steel pressure vessels and chemical storage tanks are incredibly cost efficient. Yes, they may require a higher upfront investment compared to chemical storage tanks and pressure vessels made from other types of materials. That being said, their overall lifecycles make them much more efficient of an investment than materials that cost slightly less and don’t last as long. If you want the ultimate durability, corrosion protection, and cost efficiency, stainless steel is the best material to use. Of course, don’t hesitate to contact your manufacturer for further recommendations. 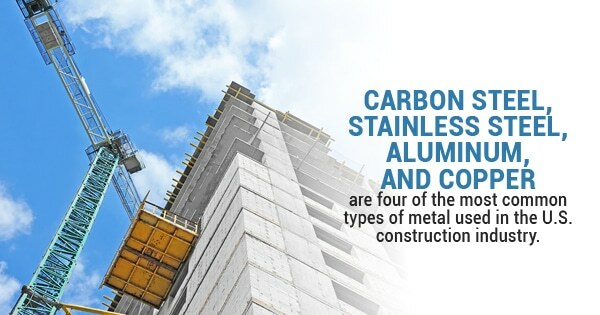 Carbon steel, stainless steel, aluminum, and copper are four of the most common types of metal used in the U.S. construction industry. But whatever type of dimpled stainless steel tanks you need, understanding these benefits can help you select the best material. For more information about stainless steel chemical tanks, contact Central Fabricators.